Centennial, CO.- The latest auction results from Mile High Card Company's October 10th sale show an unprecedented demand for "The Best of the Best" as exceptionally high grade and key rarities performed to nearly unprecedented levels. "As a firm we are exceptionally pleased with the overall results of this sale and we saw an impressive amount of interest and demand for great material", said Brian Drent, President of Mile High Card Company. 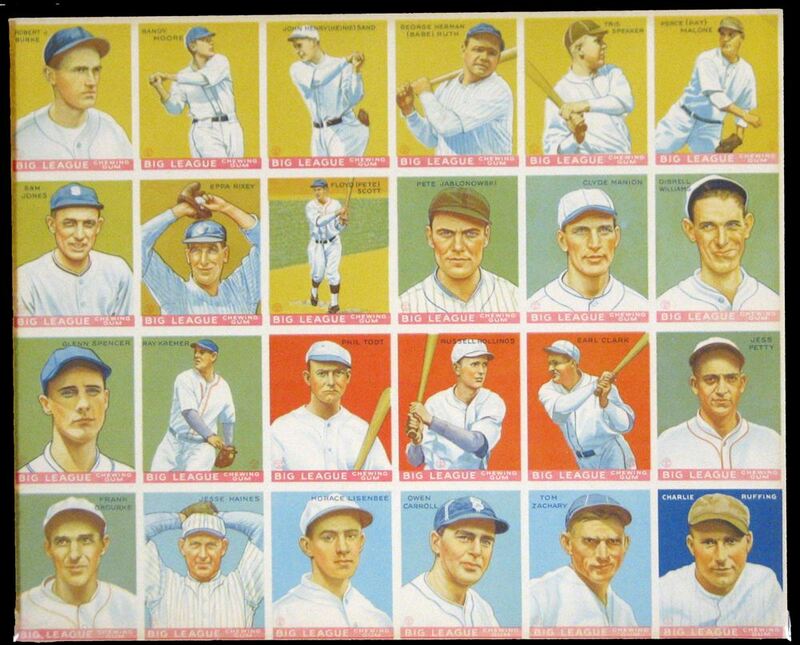 "From the historic offering of the 1917 Collins McCarthy set as well as the 1916 Sporting News set from the E.C. 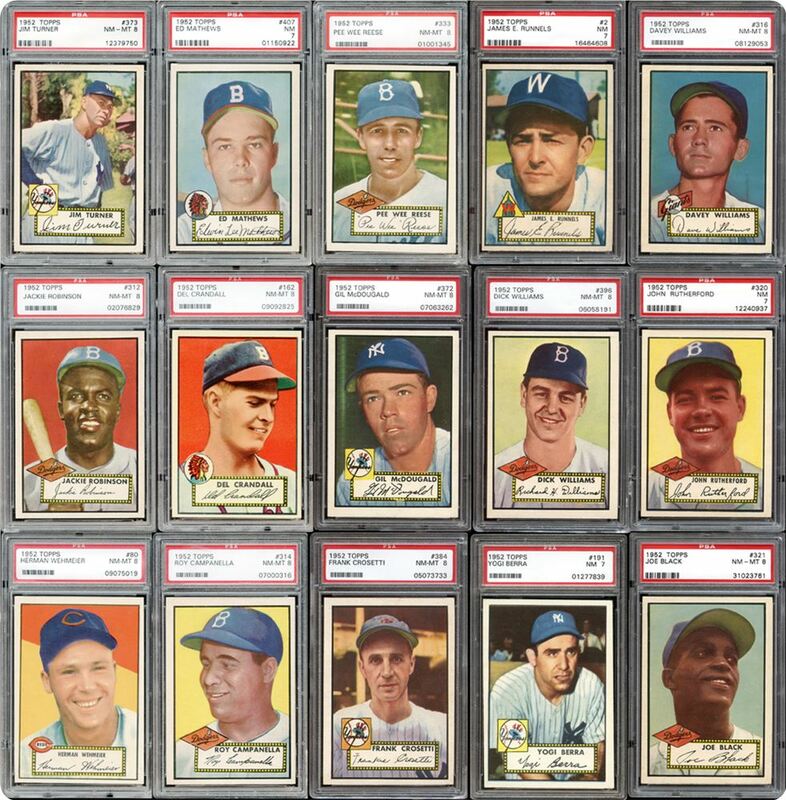 McCoid "Field Of Dreams" find to the astounding selection of pristine Mickey Mantle cards, the auction afforded collectors an unsurpassed opportunity to add truly rare items to their collections". "This auction was really a great representation of the adage that if tremendous material is offered collectors will surely take note, and this showed through with the immense passion of our customers," added Drent. "MHCC will certainly continue to honor our clients' passion by providing the very best and highest caliber items in all of our auctions." 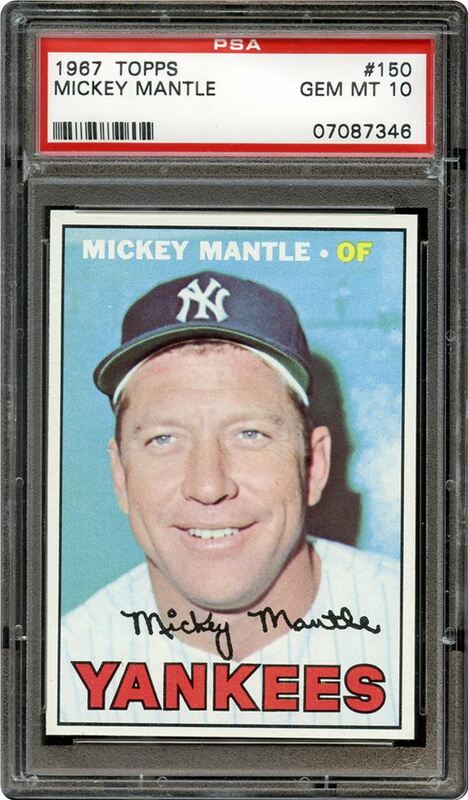 Heralding the attention commanding prices realized was definitely the dramatic prices paid for high end Mickey Mantle cards including the following: A stunning 1951 Bowman #253 Mickey Mantle MINT 9 realized $127,809.00, while an equally impressive price of $57,939.00 was paid for a 1954 Bowman #65 Mickey Mantle PSA 9 MINT, also performing to an excellent level was a 1953 Topps #82 Mickey Mantle PSA 8 NM/MT which found a new home to the tune of $13,062.00, and one of the auction stunners was the price paid for a 1967 Topps #150 Mickey Mantle graded PSA 10 GEM MINT which sold for an astounding $68,676.00. 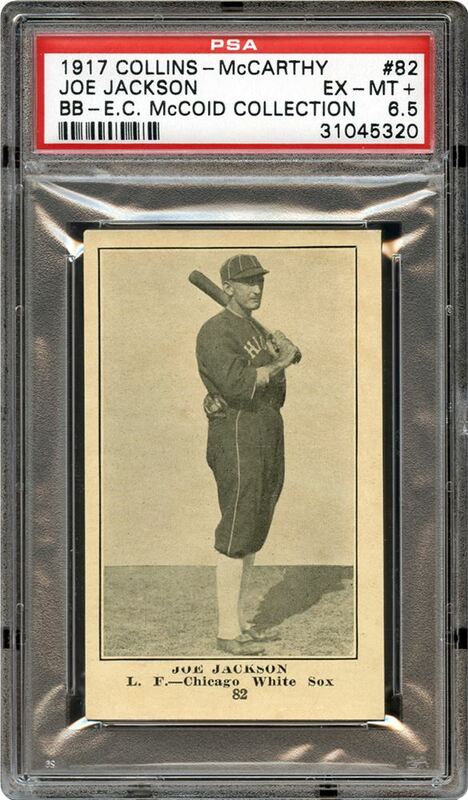 Aside from the record prices of the Mickey Mantle cards, other front line performers included the following: A stunning 1909-11 T206 Christy Mathewson "Dark Cap" PSA 8.5 NM-MT+ The Highest Graded Example On The PSA Population Report sold for $34,693.00, as well as a 1909 T204 Ramly Walter Johnson PSA 6 EX-MT which found a new home at $29,717.00; also achieving success was an Exceedingly Rare 1933 Goudey Final Production Sheet Featuring #53 Babe Ruth And Four Other Hall Of Famers, which was sold for $31,520.72. 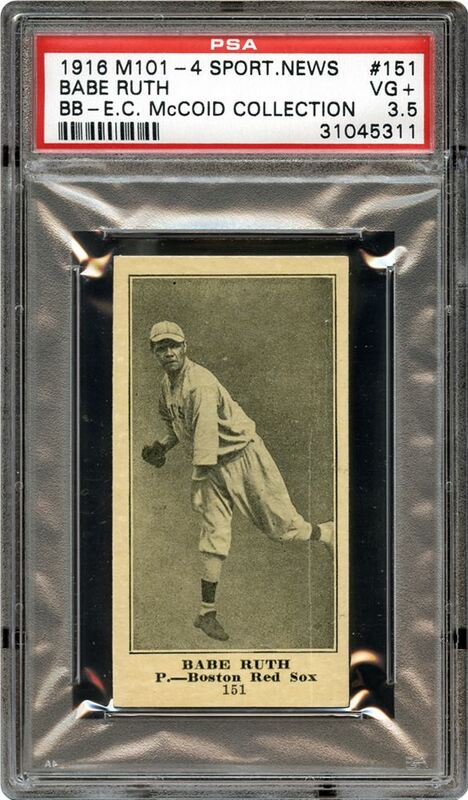 Also performing to expectant levels was a 1909 T206 Eddie Plank Sweet Caporal 350 Series PSA 5 which was hammered at $78,958.00, and finding a new home was a 1972 Topps #299 Hank Aaron PSA 10 GEM MINT at a stunning $20,655.00. 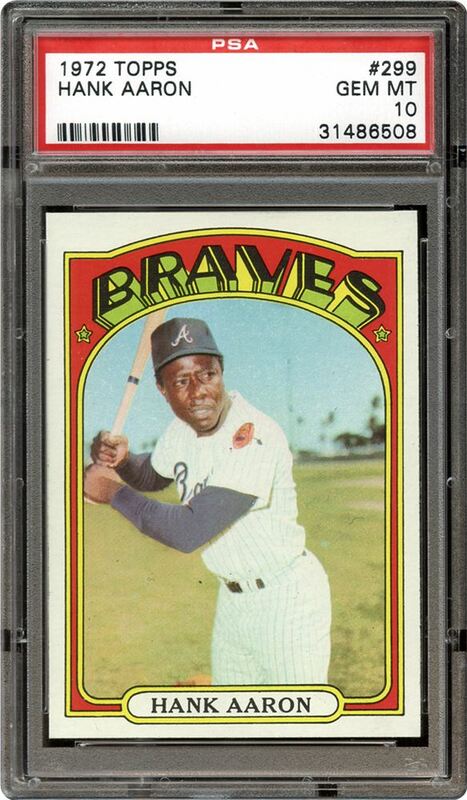 Mile High Card Company was very privileged to be able to handle the recently found E.C. 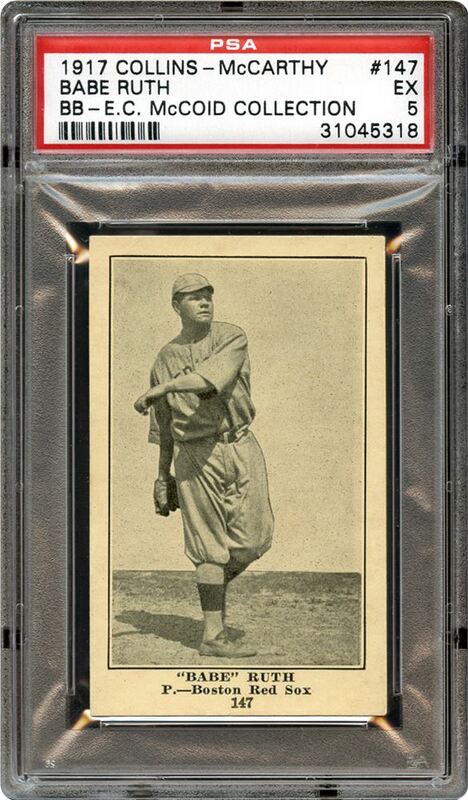 McCoid "Field Of Dreams" Find and the collection surely didn't disappoint with a considerable amount of bidding attention focused on the impressive array of cards, the following are some of the highlights from this section of the auction: A 1917 Collins-McCarthy #147 Babe Ruth PSA 5 EX The Highest Graded Example On Both The PSA Population Report was executed at $68,816.00, while a stunning 1917 Collins-McCarthy #82 Joe Jackson PSA 6.5 EX-MT+ The Highest Graded Example On The PSA Population Report sold for $27,179.00, and a 1917 Collins-McCarthy #80 Rogers Hornsby PSA 6.5 EX/MT+ Rookie Card- The Highest Graded Example On The PSA Population Report sold for $21,105.00, as well a 1916 M101-4 Sporting News Blank Back Complete Set All PSA Graded (nearly all graded PSA 3/3.5) sold for an impressive $90,227.00, in accord with the sale of complete sets the 1952 Topps Completely PSA Graded Near Complete Master Set (Missing Mantle) sold aggregately to the impressive tune of $199,869.00, as well many other complete sets sold at equally impressive totals including the following: A 1911 T212 Obak High Grade Complete Set #1 All-Time on PSA Set Registry with Original Coupon sold for $19,331.00, as well a 1955 Bowman Master Baseball Complete Set #6 Current Finest on PSA Set Registry sold for $21,647.00, also the 1965 Topps Baseball Complete Set Completely PSA Graded #3 On The PSA Set Registry which sold aggregately for $73,729.00, as well a stunning 1961 Fleer Basketball Complete Set #7 Current Finest on Set Registry sold for an impressive $29,966.00. 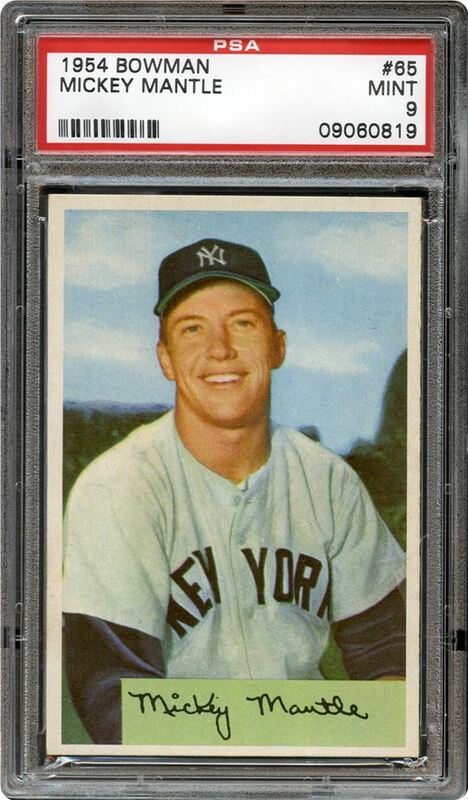 As with most MHCC auctions, sports cards are a major focus but with each continuing auction quality memorabilia becomes much more of a focus and below you will find some of the highlights in the October 10th auction: A terrific 1960 Roger Maris New York Yankees Most Valuable Player Award (Dieges and Clust) sold for $15,405.00, a 1982 St. Louis Cardinals World Series Trophy sold for a final price of $3,834.00, a tremendous example of a Circa 1910 Ty Cobb "Fan for a Fan" sold for $6,170.00, an Exceedingly Scarce Type I Photograph of Newly Elected HOFer Alex Pompez sold for a stunning $1,465.00, a Spectacular Early Career Roberto Clemente Single-Signed ONL (Giles) Ball PSA/DNA MINT 9 sold for $9,345.00, a 1960 Willard Brown (HOF) Signed Puerto Rican "Santurce" Contract sold for $1,705.00, a 1979 Lou Brock St. Louis Cardinals Game-Used Jersey changed hands to the tune of $3,327.00, a Barry Bonds Professional Model Game-Used and Signed Bat Home Run #542 PSA GU 10 found a new home at $5,305.00, as well a Chicago Bulls Larry O'Brien Championship Trophy sold for $8,422.00, a 2001-2002 Kobe Bryant Los Angeles Lakers Game-Used Jersey with 9/11 Patch was hammered down at $5,969.00, and a 1983-84 Edmonton Oilers Stanley Cup Miniature Trophy sold for an impressive $5,105.00. According to Mile High Card Company founder and President, Brian Drent, "we had an exceptional amount of newly registered and actively bidding registered users, which is more new customers than we've ever had for any particular auction. Our numbers were strong, sure, but I think that in itself is a good sign for the hobby. I know it's definitely a good one for us." 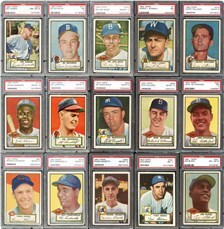 Mile High Card Company has distinguished itself as the elite auction house in regards to exceptionally high end sports cards and consistently realizes record-setting prices for the world's finest sets and high-grade singles that, in many cases, far outdistance the competition. As a follow-up to this highly successful event, MHCC is currently planning a December 2013 premier catalog auction, and is actively seeking consignments. 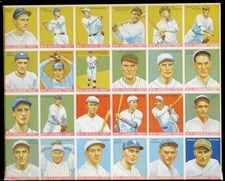 To consign your treasured material to the hobby's most consistently reliable auction house, or to register with the company and receive free catalogs for future events, please visit www.milehighcardco.com or call Mile High Card Company directly at 303.840.2784 (8:00-5:00 MST M-F).